Much like the man who created the shoes, Ray Allen had several defining moments in his NBA career in Air Jordan footwear. 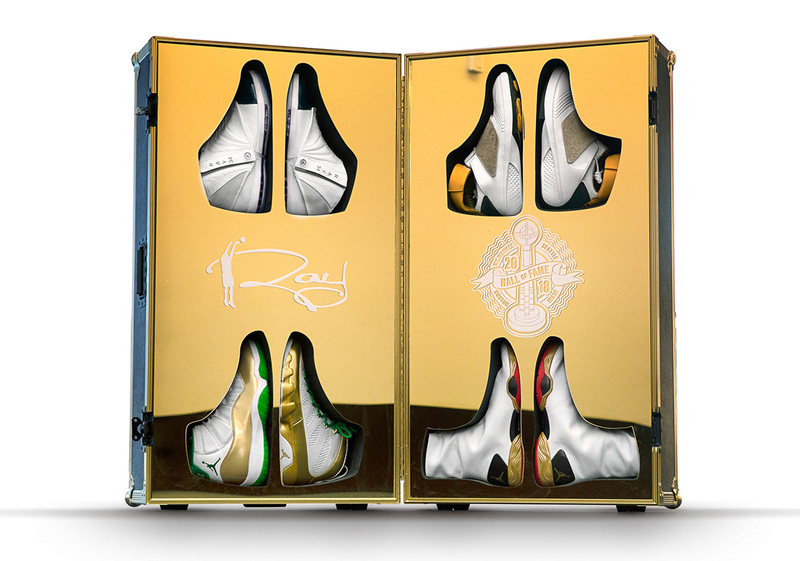 As a celebratory gesture to the now Hall Of Fame player, Jordan Brand gifted Ray with an Air Jordan trunk in black and gold holding four pairs of iconic sneakers from Ray’s illustrious career. It starts with the Air Jordan 16 in a Milwaukee Bucks PE colorway, which was worn during Ray’s first-ever Three-Point contest win and second NBA All-Star Game. The Air Jordan 20 nods to Ray’s time in Seattle. The mis-matched Air Jordan 9 and Air Jordan 11 refer to the 2008 NBA Finals, during which Ray swapped shoes during a pre-game shootaround. Finally, the Air Jordan 28 recalls the unforgettable corner three-pointer that extended the series, allowing the Miami Heat to secure a ring. Ray Allen took to Instagram and Instagram Stories to give fans a first look at the “unboxing” of this gift set, which was presented to him by long-time friend and Jordan Brand employee Gentry Humphrey. See below for a quick recap and check @trayfour on IG to see the entire thing. Wow! Gentry Humphrey of @jumpman23 gifts Ray Allen an incredible trunk of PEs that commemorate his epic career moments. Truly dope gesture but Jordan Brand. What’s your favorite Air Jordan PE for Ray? For a closer look at the shoes, tap the link in our bio.